We rejoice with you on your forthcoming Marriage. God has called you two to love and to care for one another all the days of your life; therefore, we at Saint John’s, want to partner with you to make sure that your Marriage is both meaningful and worshipful. 1) You need to be able to legally marry. consisting of an hour each session. 4) The bride and groom need to be baptized and be practicing Christians. 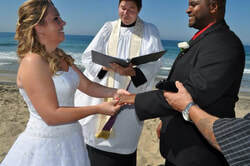 If not baptized, we would glad to help you to receive this sacrament prior to your marriage. The clergy and the staff of Saint John’s are here to assist you. If you have any questions concerning this most special of days, please do not hesitate to call us: (619) 422-4141 Church Office.